In between the fringe events, receptions and the conference bar, conference season plays out on social media as well as behind the secure zone fencing. 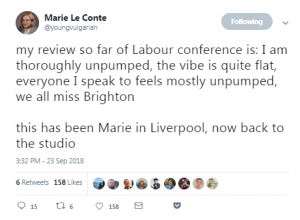 Political journalist Marie Le Conte took to Twitter at the start of Labour’s Conference, summing up the atmosphere in the Pullman Hotel and surrounding bars perfectly. “My review so far of Labour conference is: I am thoroughly unpumped, the vibe is quite flat, everyone I speak to feels mostly unpumped, we all miss Brighton”. Her take is spot on; energy is lacking and the enthusiasm that Labour is often known for is not reverberating from the walls of the hotel bars. Events on Sunday night were muted and discussions that took place around the future of the party were inconclusive. But, maybe this year you need to be in the Conference Hall itself to feel the energy? 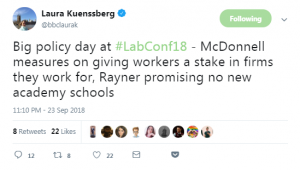 This is the first year where the centrists of the Labour Party are on the side-lines while the hard left are on the stage, leading the fringe events and speaking about the new way to work with Labour. This is giving everyone something to talk about, but no one quite knows how to process it. Muted scepticism and quiet fear has swept over the docks in Liverpool. One of the defining moments of the first 48 hours, is furore around the announcement that Labour would support a #PeoplesVote on the outcome of the Brexit negotiations. 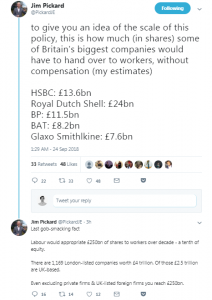 McDonnell backtracked the announcement ahead of his speech, confirming to journalists that the referendum that Labour would support would not include a “Remain” option, rather solely a “DEAL” or “NO DEAL” option, contradicting what had previously been reported. 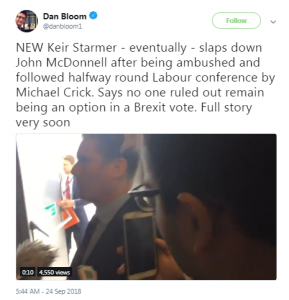 Keir Starmer, Shadow Brexit Secretary slapped down McDonnell’s comments on a video posted to Twitter saying that “no one ruled out Remain as an option. 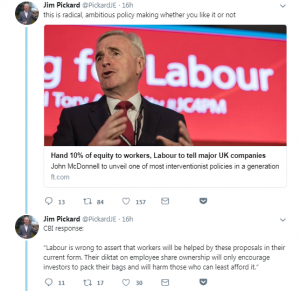 There was 300 people in the room last night and that was completely clear.” McDonnell has since backtracked on his comments saying that remain is still all on the cards, but his dismissal earlier in the day is telling. Ahead of this conference, a YouGov survey of 1,054 Labour members commissioned by the People’s Vote campaign found that 86% of respondents said they wanted a final, public vote on the outcome of Brexit negotiations. Unsurprising then, that the motion to support a People’s Vote passed during a vote at Conference yesterday. Critically, Corbyn has said that he will be bound by the democracy of the party. Maybe Marie is right and this conference will be flat all the way through to Wednesday. The quiet fear in people’s eyes as you walk into the Pullman bar speaks volumes as McDonnell and Corbyn pace forwards. We might have some more fireworks kicking off in the coming days as Labour continues to struggle on their Brexit position and fails to give any clarity on the view of the party.